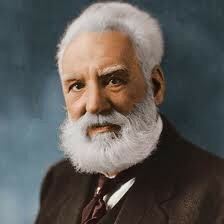 Alexander Graham Bell is known as one of the most famous inventors of all time. Alexander was born on March 3, 1847 in Edinburgh, Scotland and died on August 2, 1922. When he was 19 he invented one of the most important inventions of peoples lives today, the telephone. Alexander had a wife named Mabel Gardiner/Bell and one child named Elise Bell. The telephone was one of the best inventions anyone has ever created. Now almost every household has one. Alexander created it in 1876. Even though it wasn't as efficient as todays telephone, it was still a hit. The very first telephone did not have a bell so the callers had to tap on the phone to let the other caller know they were being called. Also the telephone was a luxury until the 1880's. With the telephones booming, by 1930, 15,193,000 were in use. 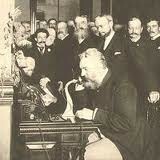 On January 15, 1915 Mr. Bell and Mr. Watson made the first transcontinental call. Bell was in New York and Watson was in California. We will never forget Alexander and his amazing invention.